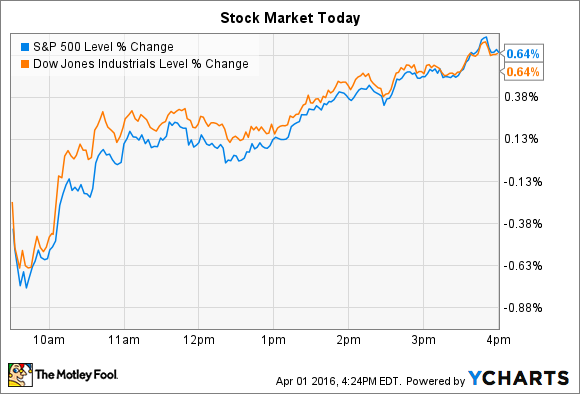 The Dow and S&P 500 ended the trading week at new highs for the year. After a sluggish start, stocks surged into the afternoon hours to end Friday's trading session at new highs for the year. The Dow Jones Industrial Average (DJINDICES:^DJI) added 108 points, or 0.6%, and the S&P 500 (SNPINDEX:^GSPC) gained 13 points, also 0.6%. In economic news, the government announced Friday morning that the economy added 215,000 jobs in March, continuing an impressive streak of healthy gains. The labor force participation rate logged its fourth straight improvement, as well, rising to 63%, and wages ticked higher. Altogether, the report described a strong job market, with average payroll gains of over 200,000 in the past three months. Meanwhile, individual stocks on the move today included Starwood Hotels (NYSE:HOT) and Rovi (NASDAQ:ROVI), which both dropped on unusually high trading volume. Starwood was one of the biggest percentage-point losers on the S&P 500, falling 5% after the company announced an end to the bidding war that had sent its shares soaring lately. An investment fund led by Anbang Insurance Group has withdrawn its buyout proposal, the hotel chain said late Thursday, which leaves Marriott (NASDAQ:MAR) as the winning suitor with an offer that's valued at roughly $13.3 billion. Anbang, which came in with an unsolicited bid well after Starwood had agreed to merge with Marriott, stepped away after Marriott raised its offer price. The investor group "does not intend to make another proposal," Starwood said. Despite Friday's drop, Starwood shareholders benefited handsomely from the contest over the past few weeks. Marriott's original deal was valued at $71 per share, but the new terms call for a total of $79 of consideration to be paid to shareholders, with a much larger component coming in the form of a direct cash payment. The parties still aim to conclude the transaction, which will create the world's largest hotel company with over 5,700 properties, by the middle of 2016. Pay-TV technology specialist Rovi saw its stock plunge 15% after it announced that negotiations with Comcast (NASDAQ:CMCSA) over the use of its products have broken down. Comcast, which is one of Rovi's largest revenue sources, has decided not to renew a license to use Rovi's technology. Because the cable giant plans to continue using the technology (which powers features like remote recording and content search on DVRs), Rovi has opted to sue Comcast for patent infringement. "After numerous attempts at negotiations, Rovi was left with no choice but to defend its intellectual property from unlicensed use," CEO Tom Carson said in a press release. That property, the company explained, "is broadly licensed throughout the North American pay-TV industry and by eight of the top 10 U.S. service providers." The implication here is that, if its rivals are paying for the rights to its technology, then Comcast should as well. Rovi shareholders would have preferred for executives to have reached a licensing agreement with Comcast. As it stands now, though, it's uncertain whether the parties will find common ground on this issue. Since it has now become a legal matter, further cooperation between Rovi and one of its largest customers could become strained, to say the least.